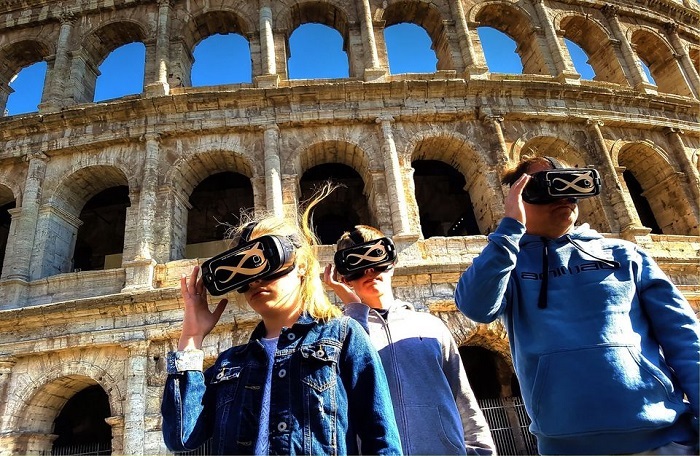 We are comparing Colosseum Skip-the-Line Self-Guided Virtual Reality Tour Prices from leading ticket suppliers and Try to find you Cheap tickets prices on the market. An interactive audio-visual tour revealing how the Colosseum really looked like during its heyday. A direct journey into the de-facto center of the Roman Empire introducing how emperors secured their positions and common people entertained themselves. A virtual reality overview of the spectacles that took place in the arena of Colosseum, including gladiatorial and wild beasts' performances. A priority entry ticket granting entry to the Colosseum, Palatine Hill and Roman Forum without waiting in long lines. Booking a virtual reality tour is highly recommended to people wishing to learn layers of history inscribed by various events staged in Colosseum. The activity is especially interesting to visitors interested in the Roman way of life and the history of the Roman Empire. Your Experience With Colosseum Skip-the-Line Self-Guided Virtual Reality Tour? Travel two millennia back in time for an out-of-the-ordinary experience. Combine a visit to the three most important sites of the ancient city of Rome - Colosseum, Forum and Palatine. Benefit of an audio-visual experience of the Colosseum, including visiting the arena, its underground passages, and gladiatorial and animal fights. After the virtual reality tour, you will skip lines to enter and explore the Colosseum on your own. More so, you will visit the Roman Forum, the hotspot of the social and cultural life in the Roman republic and empire. Visit remains of villas that belonged to wealthy Romans on Palatine Hill. What Colosseum Skip-the-Line Self-Guided Virtual Reality Tour Includes? An audio-visual assistant for the headset delivering the augmented reality experience. Skip-the-line tickets for the Colosseum, Palatine Hill and Roman Forum. Colloseum used to be a query for extracting stones used for the construction of the Saint Peter's Basilica in the Vatican and some other famous structures. Palatine Hill is where the house of Romulus, a mythical founder of Rome, used to be. Plan a lot of time to visit the Colosseum, Forum and Palatine, maybe even an entire day. Travelers Reviews about Colosseum Skip-the-Line Self-Guided Virtual Reality Tour? According to travelers, saying that their experience was a great one would be an understatement. They were very satisfied with the assistance they received from an assigned guide, who explained everything well. People entertained themselves very much during this virtual reality overview of the Colosseum. The reviews indicate that tourists achieved a great knowledge and understanding of how things worked in the Roman times. According to several comments, the tour highlights the might and magnificence of the Roman Empire during its peak. The activity is suitable for people in wheelchairs. Both paper and electronic vouchers are acceptable for taking part in the VR tour. To redeem a full refund, cancel the order no later than 24 hours in advance. The minimum number of visitors is two. Because of a fair amount of walking, you should put on shoes suitable for strolling. You can't bring large luggage inside the related attractions. Children are welcome to partake in the tour in the company of adults.